Photo prise depuis "Le promontoire" massif de Bavella, Corse. NIKON D750 + TAMRON 15-30 2,8 ƒ/16.0, 15.0 mm, 1/100, ISO 100. 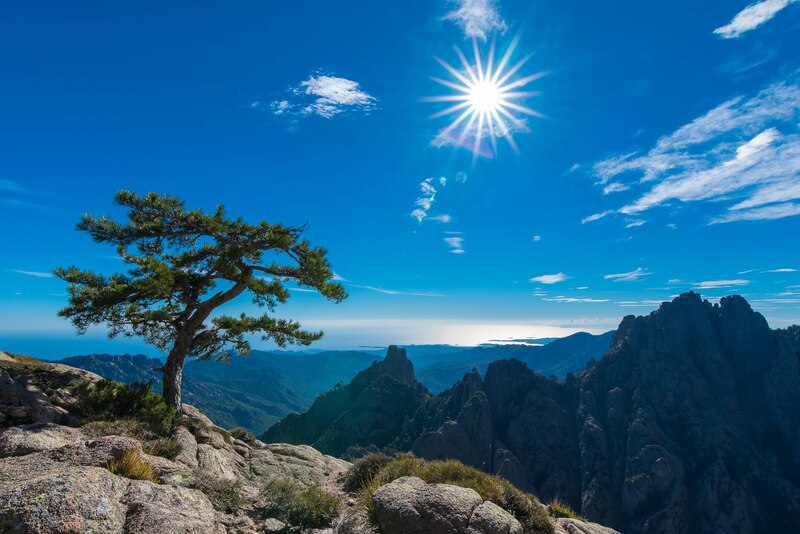 The aiguilles de Bavella (I Forchi di Bavedda in Corsican) dominate the hill of the same name at 1218 m, connecting the Alta Rocca to the east coast of Corsica. The massif is smaller yet much more popular than the "aiguilles de Popolasca". The site is characterized by jagged peaks, large rock walls and pine twited by the wind. The whole "Bavella massif" standing at 1899 m with both "Punta di u Furnellu" (Punta llu Furneddu) and "Punta Muvrareccia" (A Mufrareccia). Highest peak of the area is the "Monte Incudine" (2134 m) and extends from the forest of Tova in the north (Solaro town) to "Monte Calva" (1381 m) in the south, the limit of the "Massif de l'Ospedale", and almost up to Conca and the sea to the east.